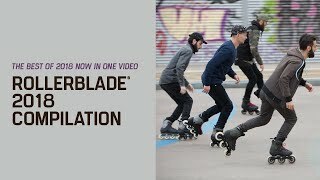 The Rollerblade Speed Team continues its road to success. After a very good start in the season, the yellow-fluo speed skaters captured many medals and podiums those last weeks. What makes the difference too is that the team works… like a team. Guillaume de Mallevoue was able to capture the silver at the Roll’athlon for example. Quentin Giraudeau finished second of the Dijon Roller Marathon (World Inline Cup), as the conclusion of an excellent team work. Finally, Doucelin Pédicone took the victory at the Maraton Patinaje de Madrid, in Spain, in late June. This last even is a Top competition sponsorised by Rollerblade, like the Berlin Marathon or the Paris Marathon the team will race in September. Before a busy month of September, many of the Rollerblade Speed Team athletes will participate to some international events with their national selections. Mexican Mike Paez will take the start of the Central American Games. Ewen Fernandez will be at the World championships with France, whereas Quentin Giraudeau and Doucelin Pédicone will take the start of the European championships. Good luck to them all !